All I could think of as I got on the climb was to fight. 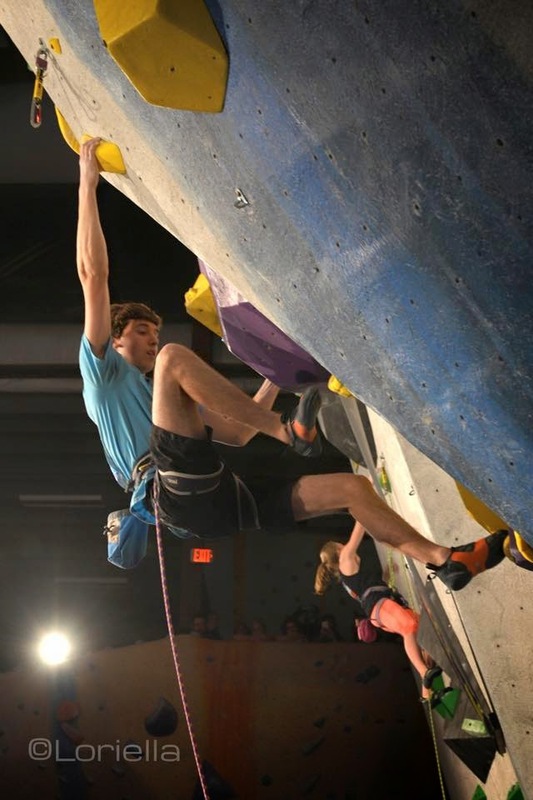 This was my first SCS Open Nationals, and I was getting onto my second qualifier climb. I knew that I had to do well. 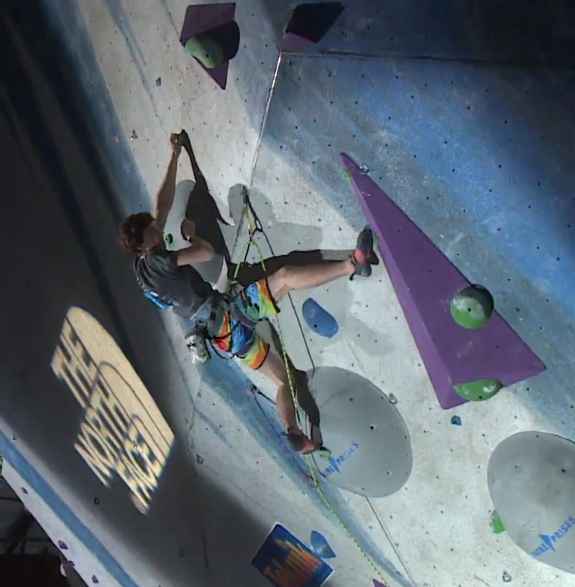 I had fallen at a much lower point than many of my competitors on my first climb, and if I wanted to make it to Semis, I would have to fight. It is one of the hardest skills to master, especially in sport climbing – knowing when to try hard. If you start to try hard too early, you will be too tired for the actual hard moves. And if you try hard too late – well, then it’s already too late. This thought process was in the back of my mind as I stepped onto the climb. The beginning of it went by fast. I stayed relaxed. Moved quickly through the cruxes, and took rests wherever I could find them (which wasn’t very often). 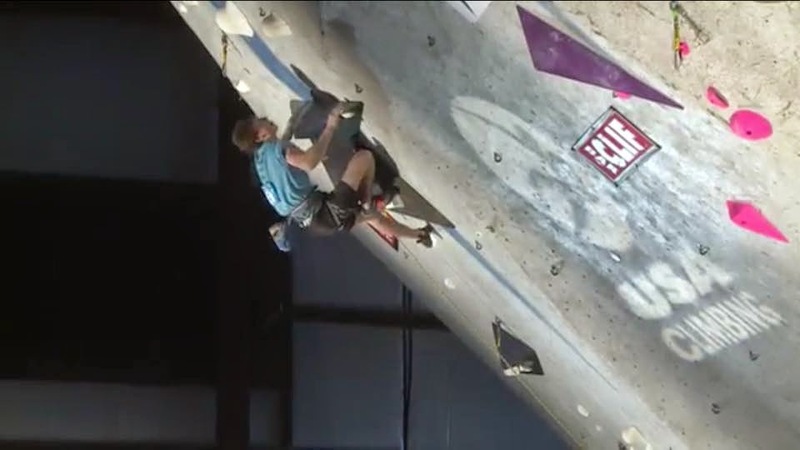 I eventually came to the last four holds, and I knew I had to try hard. But first I decided to take a little knee bar break – taking both hands off. Which ended in me . . .
. . . Falling. Lesson learned. Don’t knee bar unless I’m super sure my knee will stay in. But never the less, I had done what I wanted. I had fought enough to advance into Semi-Finals! And I even ranked 4th on this climb. Pretty cool!!! Coming into this competition, my goal was to make Semi-finals, and I had succeeded! Now I could take any pressure off as I moved into the next round. I do my best when I’m not pressuring myself to place well, but trying hard to stay onto a climb. Trying to do well, but not worrying about the end result. 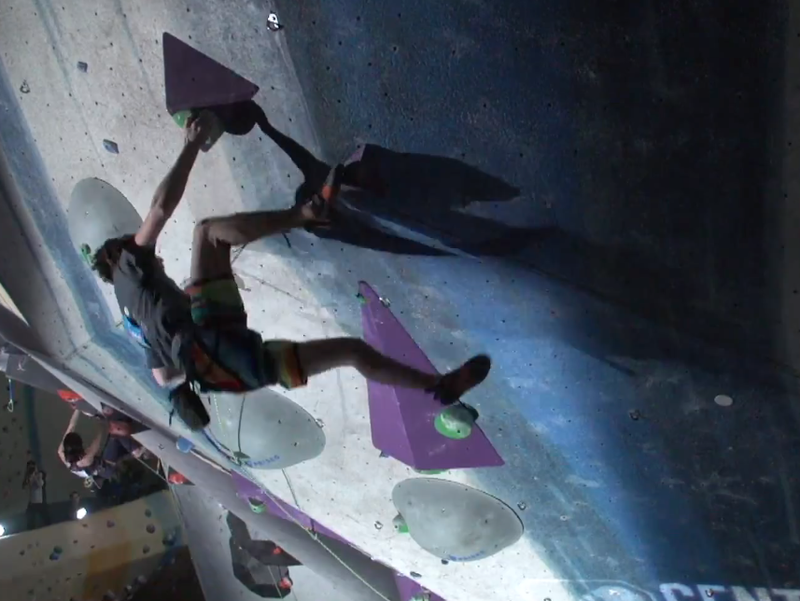 If I get onto a climb wanting to win, I probably won’t climb to the best of my ability. But if I get on a climb with the intent of doing my best, and trying hard not to let go, then the higher placement will follow. The next day, I wasn’t worried about falling or making sure I could secure a spot to Finals because I doubted I would make it to Finals. I just wanted to try hard enough so that, when I got down, I would feel like I had given it my all, or near to my all. So that was the mentality I had – have fun and try. The stopper move (the part that basically decides whether you make it to Finals or not) was a turn around move (throwing your feet above your hands) off of a two-finger pocket. I have never been that good at turn arounds. But after falling on one at the Youth Pan-American Championships this year, I was determined to succeed at this one. I readjusted more than three times. Squeezing. Squeezing. And squeezing. Until, finally, I successfully grabbed the crux hold. I rested a bit and then started plowing my way to the top. I made it two holds after the above picture, and then fell. It was such an amazing feeling. I felt like, while I might not have reached my limit, I left most of my fight on the wall. I ended up placing Fifth and moving into Finals!!! This was a huge accomplishment for me. I had not expected to do so well in the slightest. Now just one more climb. My coach, Randi, calls Finals “the victory lap,” which I think is the perfect way of looking at it for me. Just making it this far meant that the months of training had paid off. Not to mention the fact that I felt better at trying hard when I needed to. I have been working on this skill for the past few years, and this Nationals I really felt this training paying off. The last climb, I think I approached with the same mentality as Semis. I wanted to leave it all on the wall, and wanted to just do my best. Enjoy the climb. Even with Semis, I think I still had a subconscious thought of wanting to make it to Finals. But, now that I was in Finals, I didn’t feel like there was anywhere up to move. (Metaphorically – I mean, yeah, in climbing there always is somewhere up you can move.) This lack of pressure, combined with my determination to have fun, and be happy with doing my best gave me a perfect combination. My “try hard” increased as I relaxed more throughout the weekend (a pretty strange combination). I got on with this good-seeming mentality, and as soon as I started climbing, I felt like I was in a new groove. I felt fluid in my motions, and felt as though I was taking it all in stride. My concentration might have been broken once when the announcer of the competition said that my spirit animal was a pregnant duck (we had to draw our spirit animal beforehand and I tried to draw a duck – apparently not well). But, apart from that, I was enjoying the climb. Claire Buhrfeind was climbing next to me on the female route, and she was finishing her climb while I was getting to the hard part of my route. The crowd was louder than ever, and this pushed me to keep going. I made it through that hard part where many other guys had fallen, and with the crowd behind me, I kept pushing and trying hard. I thought I was going to fall, and bumped my right hand. I was able to grab one last hold. I threw, and then fell. I was so exhausted when I got down, but I felt awesome. I was told that I was First thus far with four more guys to go! That meant at worst I was Fifth! Awesome! My first Open Nationals, and Fifth was not a bad place to be (understatement). But then we watched as the next guy fell, and the next, and then the next! I was in Second! Kai Lightner had a spectacular performance, and was able to grab the hold I fell off of, and then throw and fall. It was such an awesome show, and such a great experience. 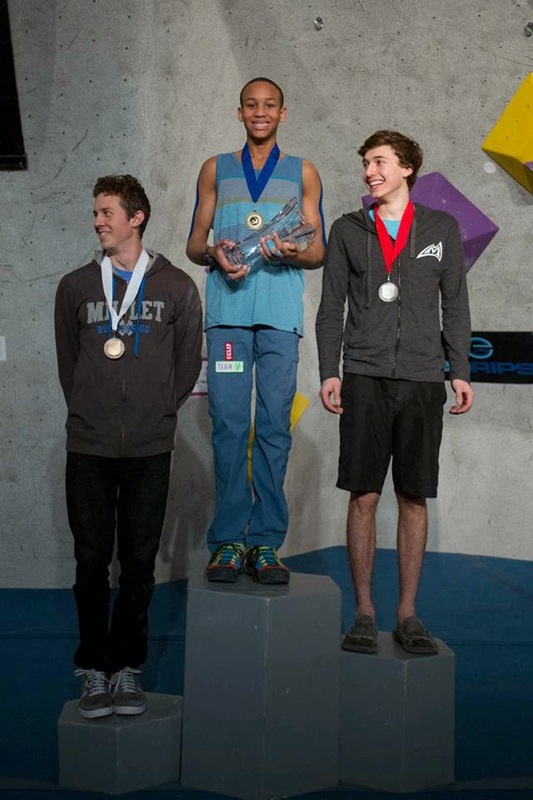 I am now Second in the country in Sport Climbing! It’s fine to be nervous, but when you are trying to perform your best, it’s important to remember to try hard while you still can. But don’t ever make this thought prevent you from relaxing and enjoying the rest of the adventure. 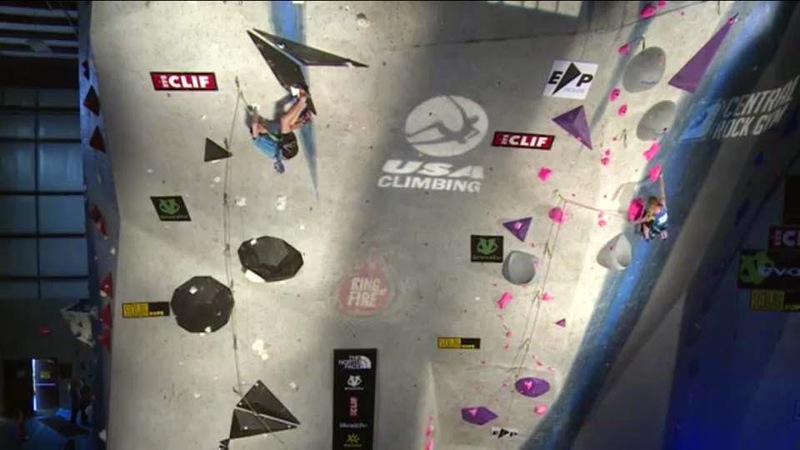 My success from this competition came from my determination to stay on when the route got hard, but also not worrying about the result of my performance. Congrats to Kai Lightner and Delaney Miller for winning the comp, and to all of the other competitors. Huge thanks to the routesetters and CRG for making the event possible, as well as my coaches, family, and friends. And, as always, I couldn’t have done it without the support of Mad Rock!